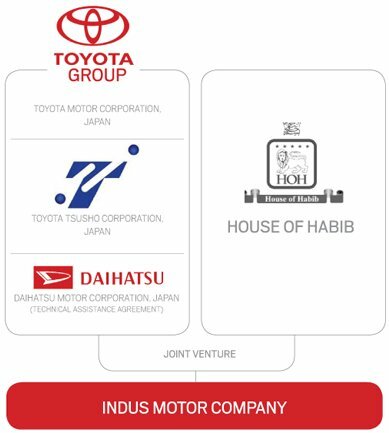 Indus Motor Company Limited (IMC) incorporated in 1989 as a joint venture company between the between the House of Habib (HOH), a local conglomerate and Toyota Motor Corporation (TMC) and Toyota Tsusho Corporation (TTC) of Japan. The company manufactures and markets Toyota brand vehicles in Pakistan. The main product offerings include several variants of the flagship “Corolla” in the passenger cars category, “Hilux” in the light commercial vehicles segment and “Fortuner” in Sport Utility Vehicle (SUV) segment. The Company also sells limited units of Daihatsu brand vehicles. scale investments in enhancing its own capacity and in meeting customer requirements for new products. Today, Corolla is the largest selling automotive brand model in Pakistan and it also has the distinction of being #1 in Toyota’s Asian market. The company invests heavily in 2,000 plus workforce of team members and management employees and creating a culture of high performing empowered teams working seamlessly across processes in search of quality and continuous improvement (kaizen). The core values of the company encourage employees to pursue high standards of business ethics and safety; communicate candidly by giving bad news first and respect for people. The bi-annual TMC morale surveys show employees giving a high positive score to the IMC work environment and level of job satisfaction. The company has played a major role in the development of the entire value chain of the local auto industry and is proud to have contributed in poverty alleviation at the grass root level by nurturing localization that in turn has directly created thousands of job opportunities and transferred technology to 60 vendors supplying parts. IMC is also a major tax payer and significant contributor towards GOP exchequer.